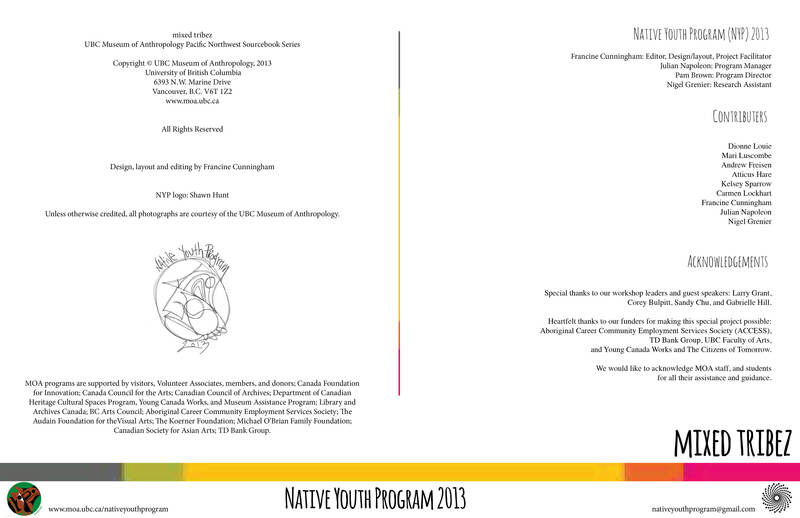 In 2013 Citizens of Tomorrow participated in the creation of a print and digital zine entitled Mixed Tribez. This project was set in a museum and got students to explore their ideas surrounding personal identity issues through the combining of traditional and digital arts based practices. 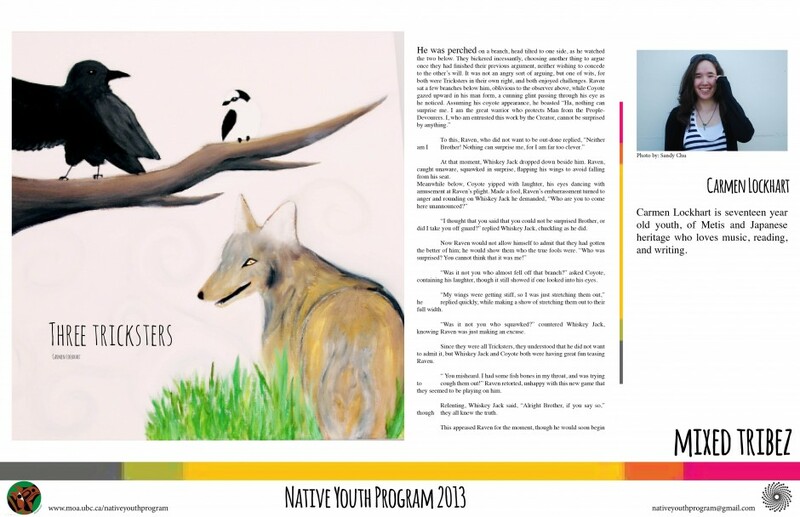 Research assistant Francine Cunningham has a long history with The Native Youth Program at The Museum of Anthropology and is the lead investigator of that community site. 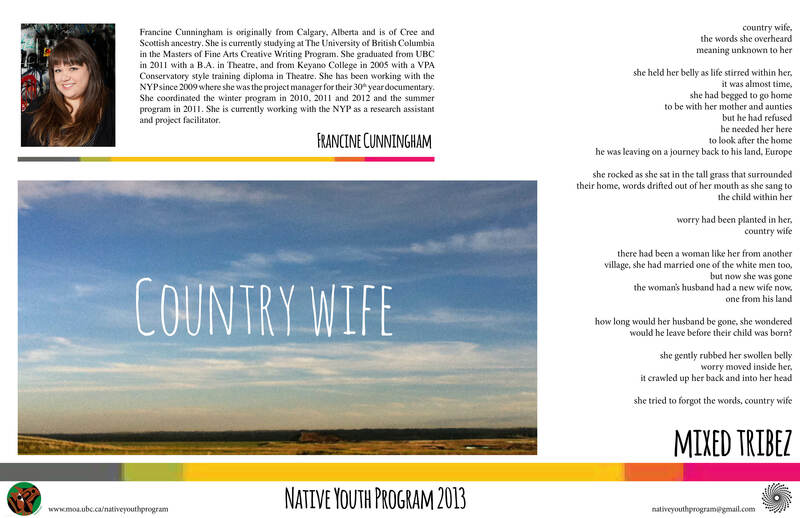 She was able to facilitate, edit and design the zine project. 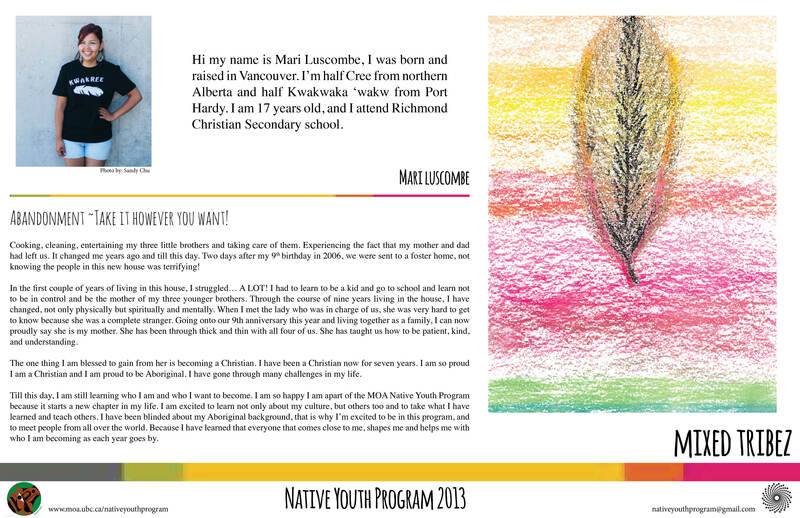 Mixed Tribez encouraged the students to explore their own feelings surrounding their First Nations heritage through discussion, guest speakers, literature and films. They also participated in creative workshops throughout the summer which provided a space for them to try new creative forms such as comics, creative writing, and visual arts. The print version of the zine is comprised of creative writing, photography and visual art such as drawing and painting. The digital version adds short film, interviews with the students and audio recording of the students reading their work aloud. 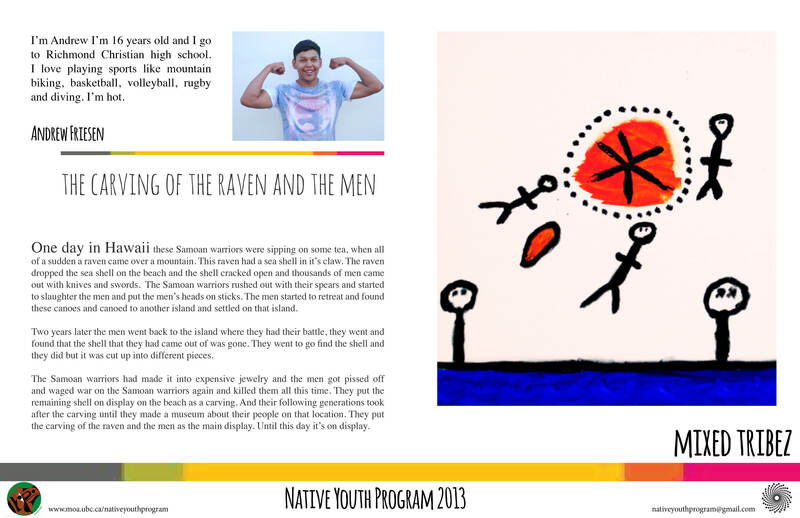 By bringing in guest Aboriginal artists, facilitating difficult and complicated discussions around Aboriginal issues and creating projects that stretched the limits of what the NYP students thought they could do. One of the fundamental aspects of the project was the idea of being able to hear the students voices. 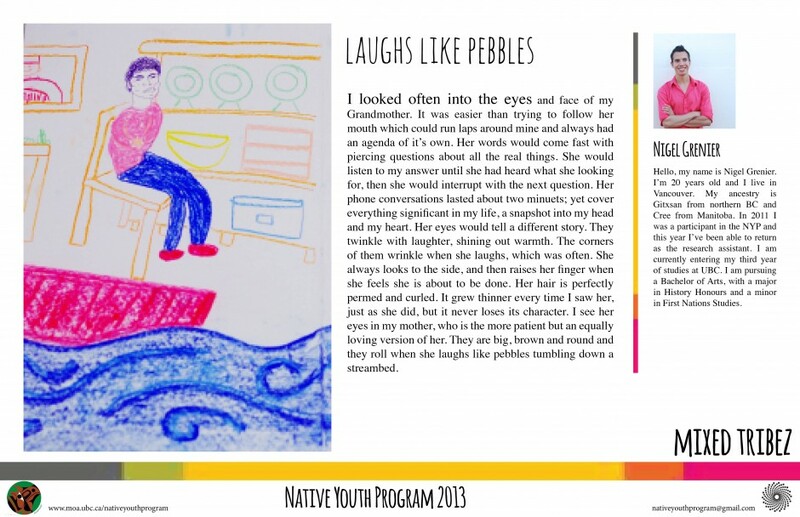 By giving them a digital platform they are able to have their voices and their stories heard. You can find a sample of the recordings below. To flip through the zine please click here. Abandoment written and read by Mari Luscombe, 2013. 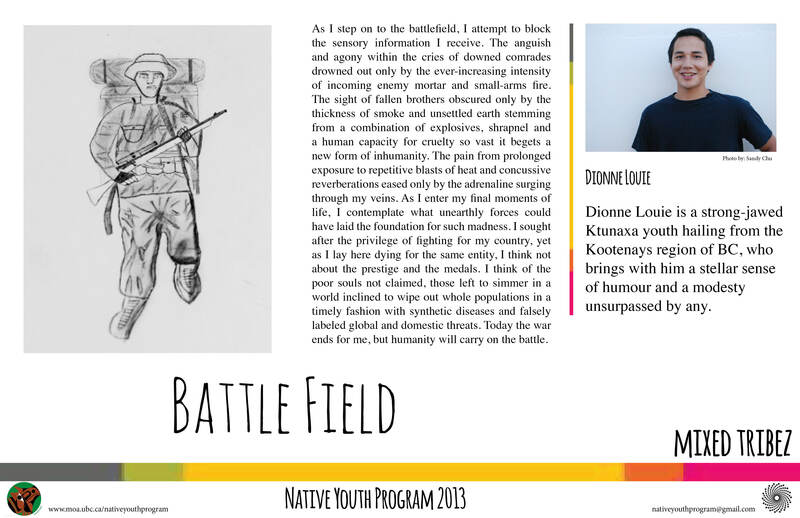 Battlefield written and read by Dionne Louie, 2013. 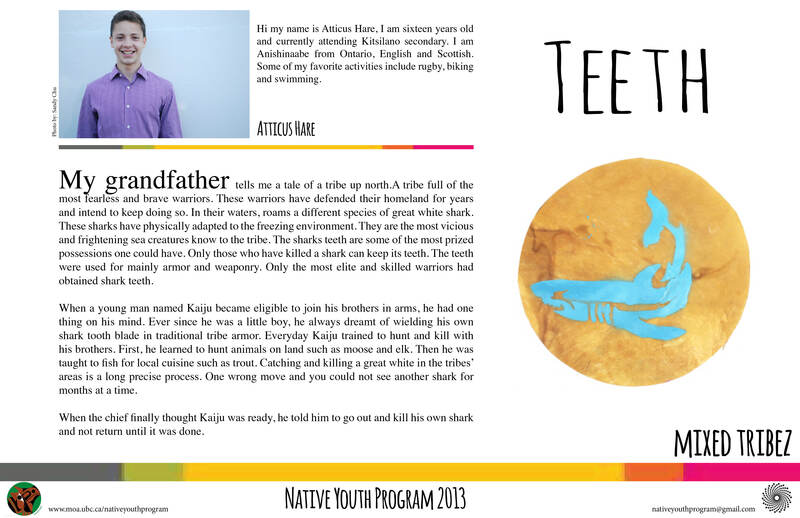 Teeth written and read by Atticus Hare, 2013. Three tricksters written and read by Carmen Lockhart, 2013. The carving of the raven and the men written by Andrew Friesen and read by Atticus Hare, 2013. 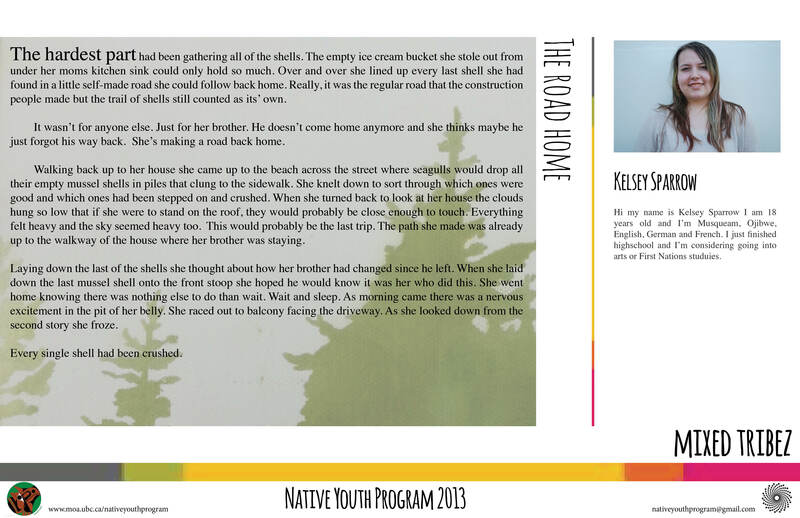 The road home written by Kelsey Sparrow and read by Francine Cunningham, 2013. Laughs like pebbles written and read by Nigel Grenier, 2013. 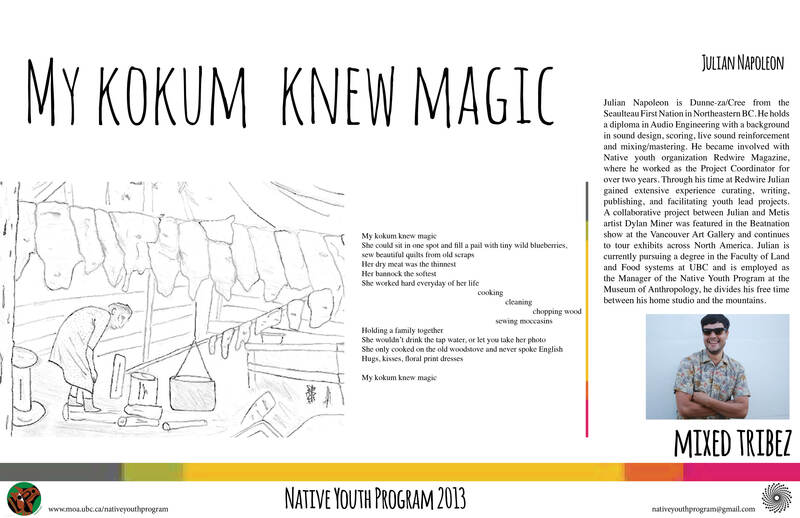 My Kokum knew magic written and read by Julian Napoleon, 2013. Country wife written and read by Francine Cunningham, 2013.